Vietnam Airlines begins new chapter with A350s, 787s. Are 777-8Xs and a strategic investor next? Vietnam Airlines has placed into service its first batch of 787-9s and A350-900s, enabling it to begin implementing a major widebody fleet renewal programme. Vietnam Airlines is only the second operator of the A350 worldwide and the successful introduction of two new-generation widebody aircraft types within only one month is a major accomplishment for a relatively small long-haul carrier. The 787s and A350s are initially intended as replacements but there will be opportunity for some modest growth in the short term including a new route from Sydney to Hanoi. The Vietnamese flag carrier is also now looking at other new widebody types, including ultra long-range variants that would be used to launch non-stop services to North America. Vietnam Airlines has been looking at the 777-8X but could instead emerge, along with Singapore Airlines, as a launch customer for the proposed A350-900ER. The biggest benefit of the new widebody fleet is increased efficiency and product improvements, including the carrier's first lie-flat business class seat. The enhancements could help Vietnam Airlines attract a strategic investor after an initial attempt to sell a stake to a foreign airline as part of its late 2014 initial public offering did not succeed. 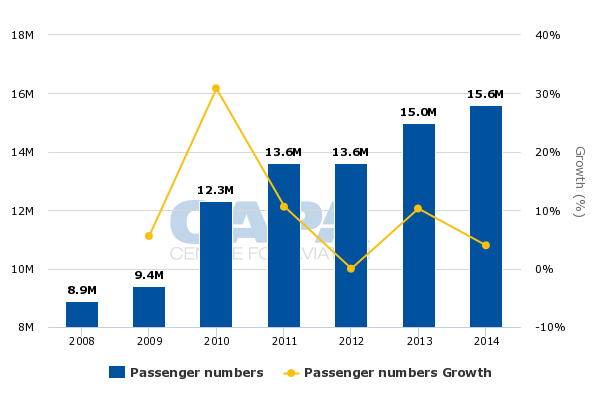 Vietnam Airlines has seen rapid growth over the last several years. The flag carrier is on pace to carry about 17 million passengers in 2015. Passenger traffic has nearly doubled since 2008, when just under 9 million passengers were transported. International passenger traffic has doubled since 2009 and now accounts for about 40% of total passenger traffic. But nearly all of the international growth has been to existing regional destinations within Asia. Vietnam Airlines’ international network currently consists of 30 year-round scheduled destinations, up by only six from 24 at the end of 2008. Vietnam currently serves just six destinations outside Asia, including two in Australia and four in Europe. Its widebody fleet shrunk slightly from 21 aircraft at the end of 2011 to 18 at the end of 2014. Vietnam Airlines took a long hiatus from expanding its long-haul operation in part because of multiple delays with the 787, which Vietnam Airlines initially planned to take from 2009. It experienced only a slight delay with the A350, which Vietnam Airlines was initially expecting to receive in 2014. Vietnam Airlines finally placed into service its first 787 in early Aug-2015. It currently operates three 787-9s and has five more on order along with eight larger 787-10s. The first 787 followed by one month Vietnam Airlines’ first A350, which was placed into service in early Jul-2015. Vietnam Airlines currently has commitments for 13 additional A350-900s. It is the second A350 operator after Qatar Airways. The arrival of the first A350 and 787 coincided with the launch of a new corporate identity, website and long-haul product. Both aircraft types feature lie-flat business class seats and a premium economy cabin. The A350 has 305 seats overall, including 29 in business and 45 in premium economy, while the slightly smaller 787-9 has 274 seats, including 28 in business and 35 in premium economy. Vietnam Airlines does not offer lie-flat business seats on its 777s and A330s, which have an average age of over 10 years. Its 777s have premium economy and are configured with 307 to 309 seats while its A330s do not have a premium economy cabin and are configured with 266 to 280 seats. At the beginning of Sep-2015 Vietnam Airlines began deploying the 787-9 on all London flights – from both Ho Chi Minh and Hanoi – marking the start of long-haul services with the new type. The A350 is still only being used on domestic flights between Hanoi and Ho Chi Minh but is scheduled to be deployed on Hanoi-Paris from the end of Sep-2015. Vietnam Airlines plans to also begin deploying the A350 on Ho Chi Minh-Paris and the 787-9 on Ho Chi Minh-Frankfurt and Hanoi-Frankfurt as more aircraft are delivered. According to OAG data, all flights to Western Europe will be operated with new generation aircraft from the end of Oct-2015. Vietnam Airlines currently operates 22 weekly flights to Western Europe including six on Hanoi-Paris, five on Hanoi-Frankfurt, three on Hanoi-London, three on Ho Chi Minh-Paris, three on Ho Chi Minh-Frankfurt and two on Ho Chi Minh-London. The carrier’s capacity to Europe fluctuates depending on the time of year but has generally been flat since the beginning of 2012. 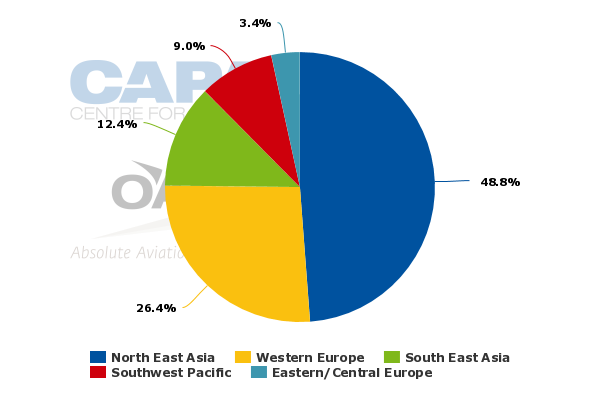 Western Europe currently accounts for less than 8% of the carrier’s international seats but 26% of its international ASKs. London is the most recent new long-haul destination and was launched in Dec-2011 with four weekly flights to Gatwick. Vietnam Airlines has since struggled in the London market and for a while suspended non-stops and only served Gatwick via Frankfurt. But it is hoping the recent switch to Heathrow, the upgraded product with the 787 and a more regular schedule will improve the performance of the route. It is now working on trying to boost its yield in the London market. Vietnam Airlines added a fifth weekly flight to London after beginning operations at Heathrow at the end of Mar-2015. It is planning to add a sixth frequency to London at the end of Oct-2015, which will give it three weekly flights from both Hanoi and Ho Chi Minh. A further increase to seven weekly flights is planned for 2016, with a fourth frequency from Hanoi, to fully utilise its daily Heathrow slot pair. London could continue to be a challenge even with a smaller and more efficient aircraft. Vietnam Airlines relies almost entirely on the local Vietnam-UK market for London. Premium demand is limited and it has also been a challenge filling the economy cabin on a year-round basis. Vietnam Airlines mainly uses Paris, the hub for SkyTeam partner Air France, for connections within Europe and beyond. France and Germany are also larger local markets for Vietnam. The current long-haul network also includes four weekly flights to Moscow, which has been reduced over the last year due to the Russian financial crisis, and daily flights to both Melbourne and Sydney. Moscow is served from both Hanoi and Ho Chi Minh with two weekly flights each while Melbourne and Sydney are currently only served from Ho Chi Minh. The Australia and Moscow routes will eventually transition to new widebody aircraft along with several medium-haul regional routes (including Osaka and Tokyo) which are now served with A330s. So far Hanoi-Seoul, which will see one of two daily flights operated with the A350 from Oct-2015, is the only route other than Western Europe or Hanoi-Ho Chi Minh scheduled to be operated with the A350 or 787. Ho Chi Minh-Sydney is expected to transition to the 787 in 2016. Vietnam Airlines is also planning to begin serving Sydney from Hanoi, which will likely be launched in 1H2016 and initially be operated with four weekly A330 frequencies. Ho Chi Minh-Melbourne is expected to transition to the 787-9 after Ho Chi Minh-Sydney. Hanoi-Melbourne is also in the Vietnam Airlines long-term network plan but is not expected to be launched in the near to medium term. Vietnam Airlines relies almost entirely on local point to point traffic for its Australia services, with most demand coming from Australia in particular the Vietnamese communities living in Melbourne and Sydney. But it aims to gradually build up sixth freedom traffic as it expands in Australia, offering connections within Asia as well as on the highly competitive kangaroo route to Europe. The carrier’s capacity to Australia has been flat over the last several years with fewer frequencies offered during off peak months in response to lower local demand. In addition to flagging the possibility of new flights from Hanoi to Sydney and Melbourne, the Vietnam Airlines IPO prospectus identified Ho Chi Minh-Brisbane as a potential new route from 2017 and Ho Chi Minh-Adelaide from 2018. The prospectus, which was published in Sep-2014, said the expansion in Australia would “take advantage of the favourable geographical position of Ho Chi Minh city to offer services to the sixth freedom traffic right markets from Europe and North East Asia to Australia”. But Vietnam Airlines could decide to forgo new destinations in Australia and instead focus on growing its existing two points. Over the last year it has studied the Australian market and determined that for now there is limited demand from cities other than Melbourne and Sydney. Overall there will be limited opportunities to expand the long-haul network in the short to medium term as nearly all the widebodies being delivered over the next three years are earmarked as replacements. Hanoi-Sydney could be the only new long-haul route launched in 2016. But there will be opportunities to pursue faster expansion when the eight 787-10 are delivered in 2019 to 2021. The 787-10 could be used on existing flights to Europe, freeing up the 787-9 for new European destinations. The Vietnam Airlines IPO prospective identified Berlin as the next European route and stated that Amsterdam, Milan and Prague were also under evaluation. It also identified Doha and Dubai in the Middle East and Delhi and Mumbai in India as potential new destinations. Vietnam Airlines currently does not have any destinations in South Asia or the Middle East. India, which Vietnam Airlines initially anticipated launching in 2015, could still potentially be launched in the short to medium term using A330s. The Middle East, which was never seen as a near-term priority, seems unlikely given the intensifying competition from Gulf carriers. Emirates, Etihad and Qatar all now serve Vietnam, providing sufficient capacity to the Middle East and a very competitive one-stop product to Europe. Vietnam Airlines also has been keen for several years to launch flights to North America, starting with Ho Chi Minh-Los Angeles. San Francisco, Washington Dulles and Vancouver are also in its network plan. All four cities have large Vietnamese populations. Plans to begin trans-Pacific services were initially pushed back due to delays with the 787. But Vietnam Airlines has now determined the 787s and A350s that it has started operating are unable to serve the US non-stop without payload restrictions. Vietnam Airlines has begun evaluating new aircraft types which would enable it to economically operate routes to North America. The evaluation of ultra long range aircraft are part of a broader plan to increase new generation widebody commitments beyond the current 30 aircraft (including the four already delivered). Vietnam Airlines has been looking at the A380 but committing to a super jumbo is highly unlikely as its long-haul routes are not thick enough to support such large aircraft. Boeing has offered the 777-8X as part a memorandum of collaboration which was forged when Vietnam Airlines took delivery of its first 787. The 777-8X is a new ultra long range aircraft which would enable Vietnam Airlines to launch non-stop services to North America. But Vietnam Airlines has not yet committed to the 777-8X and Airbus will be keen to promote the A350-900ER as an alternative option for the ultra long-range requirement. Singapore Airlines (SIA) has been pushing Airbus to develop the A350-900ER, which could be delivered as early as 2018 or two years ahead of the expected entry into service date for the 777-8X. SIA is keen to resume non-stop services to the US in 2018 and does not want to wait for the 777-8X. Airbus has not yet launched A350-900ER and will likely need orders from multiple customers to justify developing the variant. A combination of orders from SIA, which would use the A350-900ER to resume non-stop flights to the US, and Vietnam Airlines could give Airbus enough commitments to proceed. Launch orders from multiple Southeast Asian carriers is the most realistic scenario for the A350-900ER as US carriers generally remain uninterested in ultra long-haul routes and Gulf carriers can use existing aircraft, including the 777-300ER and A380, to serve North America and virtually all potential destinations from their Gulf hubs. SIA sees a potential opportunity with new technology to efficiently operate non-stops to North America. It ended all-business A340-500 services to Newark and Los Angeles in late 2013. Thai Airways also previously used the A340-500 to operate non-stops to Los Angeles and New York. Currently Philippine Airlines is the only remaining Southeast Asian airline with non-stop services to North America but has a geographical advantage as Manila can be reached from the west coast of North America with the 777-300ER. Vietnam Airlines remains keen to launch non-stops to North America and will likely take a stab at some point. But inevitably it could discover that it will be difficult to generate sufficient yields to make ultra long-haul flights profitable from Vietnam even with new technology. The Singapore-US market is smaller and not growing as fast but has a much larger premium component, a critical factor for making ultra long-haul routes viable. Future decisions on long-haul aircraft and network could be influenced by a new strategic partner. Any foreign carrier which invests in Vietnam Airlines will clearly want to have a say on new routes and aircraft types, which could generate network and fleet synergies for the buyer. Vietnam Airlines initially sought to sell a 20% stake to a foreign strategic investor in 2014 as part of its IPO process. But it failed to find a suitor and ended up completing its IPO in Nov-2014 without selling the 20% stake set aside for a foreign strategic investor. Only a small stake of about 3.5% was sold to the public in Vietnam, raising USD51 million. The company has still not formally been listed on the Ho Chi Minh Stock Exchange. This is not unusual for Vietnam, where companies often wait several months after an IPO is completed before trading of the stock begins. But such conditions could have impacted overseas interest in Vietnam Airlines. Vietnam Airlines stock is expected to finally begin trading within the next few months. It also continues to look for a strategic investor with the hopes of completing a deal by the end of 2015. There have been continuing discussions with foreign airline groups as well as potential overseas investors from outside the industry. Vietnam Airlines has a relatively bright outlook. The airline group, which also includes a 70% stake in Vietnamese LCC Jetstar Pacific, is well positioned as the leader in one of the world’s fastest growing aviation markets. The domestic market continues to grow rapidly and is a duopoly with VietJet, a fast-growing LCC which is also now preparing for an IPO. Competition with VietJet has intensified but the market has been expanding fast enough to support profitable growth for all three Vietnamese carriers (Vietnam Airlines, Jetstar Pacific and VietJet). The inbound and outbound international markets are also expanding, giving Vietnam Airlines opportunities both regionally within Asia and in the relatively untapped long-haul sector. Vietnam Airlines plans to continue expanding its regional international operation over the next few years with more capacity to existing destinations as well as new services to Bali, Manila and several new destinations in China. 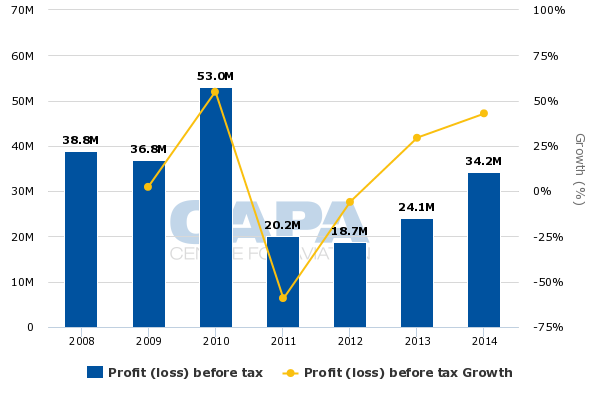 Vietnam Airlines has consistently been profitable since 2008, according to the figures provided in its IPO prospectus. Accumulated group pre-tax profits exceed USD200 million over the last seven years. While the group will not start releasing regular financial statements until it finally becomes listed, the company reportedly turned a pre-tax profit of VND430 billion (USD19) million in 1H2015. The difficulty so far in attracting foreign investors is likely driven by concerns over corporate governance and potential government meddling. Vietnam Airlines has opened a new chapter in its 59-year history as it has introduced new generation widebody aircraft, an improved product and new corporate identity. But it still has a mountain to climb if it is to meet its goal of becoming one of the leading airlines in Southeast Asia.